Stung by critics who perceived spirituals as painful reminders of slavery, uplifted by the praise of royalty and world-renowned artists, John Wesley Work II toiled for three decades at Fisk University with single-minded determination to promulgate the good news of jubilee songcraft. Here for the first time his story is told in vivid detail by celebrated author Doug Seroff, accompanied by the 43 extant selections recorded by the Fisk Quartet when Work led the group—including all nine legendary Edison cylinders that feature Roland Hayes as second tenor and the four recitations of Paul Laurence Dunbar’s poetry by James A. Myers. The selections are programmed as four mini-concerts and introduced by spoken excerpts from Rev. Jerome I. Wright, one of the last living Fisk students to have sung under John Work’s direction. Two CDs, more than 100 pages of history and illustrations, and recording notes by Tim Brooks, author of Lost Sounds, give voice to the bondsman’s hope and breath to the freedman’s courage. An undergraduate at Fisk in the early 1890s and a faculty member by the late 1890s, John Work II resuscitated the Jubilee Singers, whose worldwide tours of the 1870s had brought renown and financial stability to the struggling Nashville institution that was founded to educate and advance the lot of former slaves. The original Singers never made any recordings, and it was some ten years before Work and his cohorts made it into a studio. From late 1909 through the spring of 1916, when he was fired, Work led both the larger groups from Fisk, as well as the foursomes selected to record for Victor, Edison, Columbia, and the small Starr company of Indiana. 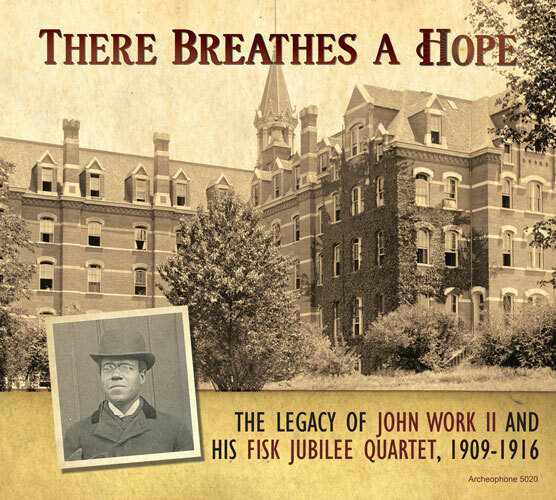 There Breathes a Hope chronciles the life and labors of John Work II in an extensive essay of original research by Doug Seroff (co-author of Ragged but Right and Out of Sight) and presents for the first time ever all the releases of the Fisk Quartet made during the Work era. The quartet of Work, first tenor, James Myers, second tenor, Noah Ryder, first bass, and Alfred King, second bass, made ten sides for Victor at the end of 1909, records that signaled a sea change in the kind of entertainment Americans could purchase for the home. As Tim Brooks points out in his recording notes accompanying Mr. Seroff’s essay, most of the recorded fare of the previous 20 years with a “jubilee” theme or African-American influence was parodic and often demeaning. With the Fisks, now black art, history, and culture were literally getting a fair hearing. Songs such as “Swing Low, Sweet Chariot” and “There Is a Balm in Gilead” were well-known, and the Fisks give masterful performances, while “Little David, Play on Yo’ Harp / Shout All Over God’s Heaven,” “Roll Jordan Roll” and “The Great Campmeeting” became instant favorites that the group were called on to perform regularly in concert. The inclusion of “Old Black Joe” may seem odd since it was written by Stephen Foster and is ultimately a “white man’s song,” but Work admired Foster and the pathos running through the performance is unlike any you have heard elsewhere. The first batch of records sold well, and the Fisk Quartet was called on to make more. Leon O’Hara had replaced King as second bass, and another rousing slate of 10 sides were produced. These are less familiar today, but they are by and large more joyful, less dour than spirituals often are perceived as being. “Band of Gideon,” “Done What You Told Me to Do,” “My Soul Is a Witness,” “I Know the Lord Laid His Hands on Me,” “Good News”—all these are songs of hope and anticipation. One possible exception is “Po’ Mo’ner Got a Home at Last,” a happy theme sung to a doleful melody and possessing perhaps the most infectious soulful singing you have ever heard on a record that was shouted into an acoustic horn. Probably the most revered African-American literary figure of his era, Paul Laurence Dunbar wrote vernacular poetry depicting life among the poor and rural blacks of late 19th-centruy America. Popular among blacks and whites alike, Dunbar’s works were read widely in public recitals—none better than by Rev. James A. Myers, who won the enthusiastic approval of Dunbar himself. Upon joining the Fisk Jubilee Quartet, Myers made his recitations part of the shows. Myers recorded four Dunbar poems during the 1909 and early 1911 sessions—”When Malindy Sings,” “In the Morning,” “Banjo Song,” and “The Old Tunes”—and these were paired up with the quartet’s spirituals on regular double-faced issues. Many today find dialect readings to be uncomfortable, but we’re wagering that when you listen closely to Myers’ masterful embodiments of the poems, you will feel transported back to a time and place far removed from our expectations of today. All four poems are reprinted in There Breathes a Hope. When Work went to Boston in late 1911 for a jubilee conference, he traveled alone apparently. While he was on the East Coast, an arrangement to record for Edison emerged, and Work was joined by three former Fisk students who lived in the area: O’Hara, first bass; Charles Wesley, second bass, and—a Fiskite who had been dismissed under controversial circumstances—Roland Hayes, second tenor. The result was a group of nine four-minute wax cylinder recordings released in May 1912. These are stunning, bright and clear examples of close spiritual harmonizing. “Peter on the Sea,” “All Over This World,” and “Crossing the Bar” are selections the Work-era Fisks did not record for any other company, making them extra special. Hayes takes lead on “My Soul Is a Witness” and the “Little David” portion of the longer medley—making these his first recordings as a lead singer. There Breathes a Hope is the first time these rare cylinders have been reissued. In 1912, Columbia dipped its feet in the spiritual market by issuing two sides by an unknown quartet called the Apollo—a group that very likely included two members of the Fisk Quartet. Three years later, in a coup they promoted heavily, Columbia signed the real deal, the Fisk Jubilee Quartet. Sessions in October 1915 and February 1916 resulted in twelve issued sides, including old chestnuts that the public apparently could not get enough of (“Swing Low,” “Little David,” “Shout All Over God’s Heaven,” “Couldn’t Hear Nobody Pray,” “The Great Camp Meeting,” “Brethren Rise”), but some selections—”O Mary, Don’t You Weep, Don’t You Mourn,” “Steal Away to Jesus,” “River of Jordan” and “In That Great Gettin’ Up Mawnin'”—were unique. Listen to the remarkable key change on “Steal Away,” the plaintive soul-bearing on “Gettin’ Up Mawnin’,” the unusual high tenor on “Swing Low,” or even the new verse on “Little David,” and you will be convinced that the Fisk groups, whatever the membership, were a tight machine when John Work was in charge. Work is joined in these recordings once again by James Myers, along with new members J. Everett Harris, baritone, and Lemuel L. Foster, bass. These would be the last of the major recordings made by John Work II; Columbia would not have a Fisk group return to the studio until 1919, and only one release came of the session. About the same time the Fisks made the second batch of recordings for Columbia (February 1916) is probably about when they recorded for the fledgling Starr record company in New York. The Indiana-based piano makers were new to the market, capitalizing on the expiration of the vertical-cut patents. They would later be known for their Gennett phonograph records, which helped put Louis Armstrong and Hoagy Carmichael on the map—but the Starr records were a different matter. Poorly recorded, poorly pressed, with limited distribution, and likely worn out by customers playing them on the wrong (Edison) equipment, the two surviving sides are an auditory challenge. Still, they are exceedingly rare versions of John Work’s Fisk Quartet doing the final versions of “Shout All Over God’s Heaven / Little David” and “I Couldn’t Hear Nobody Pray.” No copy has been located of the other Fisk recordings for Starr, the secular “A Perfect Day” and “Goin’ Up.” In a way, the strained quality is fitting: because these sounds of jubilee songcraft have been suppressed, unheard, distant, and foreign to music lovers and historians for nearly a century. Work’s career at Fisk had been marked by institutional battles over the role jubilee song played in a tradiitonal music education. Under Work’s leadership, jubilee songs rose from something shunned, marginalized as an out-of-date relic of the past to a legitimiate American folksong and source of pride for the African-American students. Doug Seroff’s essay documents this transition and tells the story of how institutional politics eventually wore Work down. Not long after the final recording sessions, Work was removed as director of the Jubliee Singers. Seroff’s portrait of Work is complimented by short excerpts of Doug Seroff’s 1983 interview with Reverend Jerome I. Wright, one of the last students to train under John Work at Fisk. Wright’s observations present a rare first-hand look at Work’s approach to music and the role jubilee singing played in student life at Fisk. Wright also speaks to the emotional influence of slavery in the singers’ understandings of the songs. Full transcripts of his interview excerpts are included in the album notes. Though Work’s story in There Breathes a Hope is often sad, the music on the set is not. Writing of the so-called “sorrow songs” in 1915, Work emphasized that through all the sadness, there was always a note of joy. The arrangements on these recordings are a testiment to this optimism, and listening to the acapella haromies one begins to realizes the complex emotional nuances in spiritual song. One also clearly hears the earliest roots of the gospel harmonies that would become popular a few years later. There Breathes a Hope is unparalleled in its presentation of these historical recordings. A collaboration between Archeophone’s production team of Richard Martin and Meagan Hennessey and Ken Flaherty, Jr (acclaimed for his production of Polk Miller and the Old South Quartet), There Breathes a Hope is the first time all of the early Fisk recordings have been collected in one’s place. Doug Seroff’s new research breaks new ground in telling the largely unknown story of John Work II, the man who singlehandedly resuscitated jubilee songcraft at Fisk, and Tim Brooks’ recording notes provide insightful background on how the record labels marketed jubilee records. Packaged in a 108-page, full-color CD-sized hardback, the set is full of beautiful illustrations and marks a new high point for Archeophone productions.